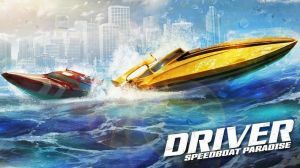 Take the wheel of a professional speedboat in this high-speed racing game where you compete in exotic locations which have plenty of sunshine, palm trees and glistening blue water. Along with racing there's buying, upgrading, and customising boats, and spending the money you earn on improving your lifestyle. There are plenty of challenges and side missions you can participate in which includes conventional 'finish first' races and boss battles. Unfortunately althrough there is a lot of great features available you will have to spend real money on in-app buys to fully enjoy them. No discussions open for Driver Speedboat Paradise at the moment.